This article was written by Kevin Hartnett. If you were opening a coffee shop, there’s a question you’d want answered: Where’s the next closest cafe? This information would help you understand your competition. This scenario is an example of a type of problem widely studied in computer science called “nearest neighbor” search. It asks, given a data set and a new data point, which point in your existing data is closest to your new point? It’s a question that comes up in many everyday situations in areas such as genomics research, image searches and Spotify recommendations. And unlike the coffee shop example, nearest neighbor questions are often very hard to answer. Over the past few decades, top minds in computer science have applied themselves to finding a better way to solve the problem. In particular, they’ve tried to address complications that arise because different data sets can use very different definitions of what it means for two points to be “close” to one another. Now, a team of computer scientists has come up with a radically new way of solving nearest neighbor problems. 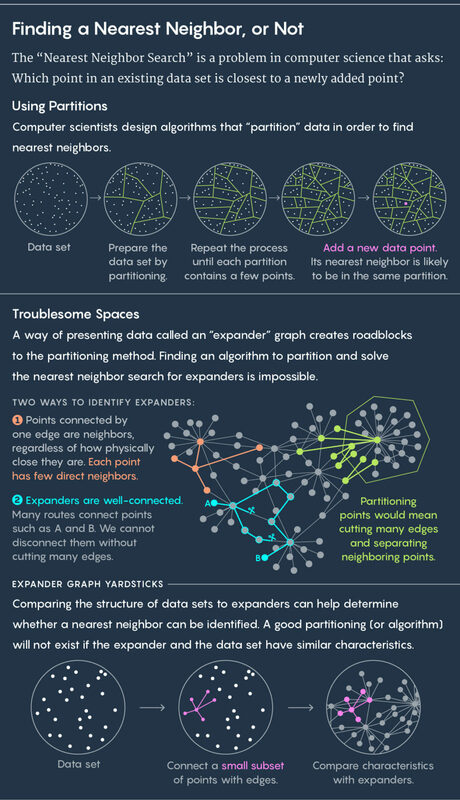 In a pair of papers, five computer scientists have elaborated the first general-purpose method of solving nearest neighbor questions for complex data. “This is the first result that captures a rich collection of spaces using a single algorithmic technique,” said Piotr Indyk, a computer scientist at the Massachusetts Institute of Technology and influential figure in the development of nearest neighbor search.